Q. Talk us through your food philosophy? A. When it comes to food, there really is no ‘one size fits all’ approach. People’s needs differ based on their genetic makeup, their digestive function, how active they are, allergies, and a whole host of other factors! The one thing that everyone will benefit from however, is a shift to a whole foods diet. That means avoiding the aisles of the supermarket and sticking mostly to the perimeter instead: veggies, fresh fruit, meats, and eggs. Q. How does your work as a naturopath shape your approach to food? A. Understanding that there are very few inherently ‘bad’ or ‘good’ foods out there is a beneficial side effect of having an education in nutrition. Becoming a naturopath taught me that food as medicine is not black and white, and that all whole foods have a place in our diet, depending on the needs of the individual. We’re in this strange place in health where we are increasingly restricting the foods we eat – low fat, gluten-free, dairy-free, low salicylate, low fructose, soy free – and I think we need a shift in mindset. Of course, some people need to reduce or eliminate irritants from the diet, but I’d really love to see more of a push for the inclusion of nutrient-dense, therapeutically active foods in the diet. Q. What is the biggest mistake we make when it comes to maintaining our energy levels throughout the day? A. Relying on ‘quick fixes’ for energy is never a good idea. It’s like shopping on credit: at some point, you need to pay it back. Caffeine and sugar are the biggest offenders here, and with their abuse comes bad sleep, weight gain, and a decline in vitality. Instead, respect your body’s natural rhythm by getting up early and making the most of the morning. Exercise and your most taxing work tasks should all be done before lunch, leaving the afternoon for less demanding jobs. By the evening, you should be allowing yourself to unwind so that your sleep is truly rejuvenating, ready to take on the next day. Q. What foods should we avoid to help cope with stress and fatigue? A. Low glycaemic snacks are essential between your whole food meals, to balance energy and ensure your body is fuelled properly. Every time you have a carbohydrate source, even a piece of fruit, pair it with a protein to steady out the energy supply. Think nuts, seeds, and eggs. A little fat will help with satiety too. My favourite go-to snack is slices of fruit coated in almond butter – yummo! Q. What is the best advice you can offer for maintaining good sleep? A. My five commandments for good sleep: no caffeine after midday, never take your work home with you, charge your phone outside your bedroom so that you’re not tempted to scroll, eat a small serve of complex carbohydrates with dinner, and get herby: passion flower, lemon balm, and valerian teas are all amazing. Q. How did #dosedaily come about? A. 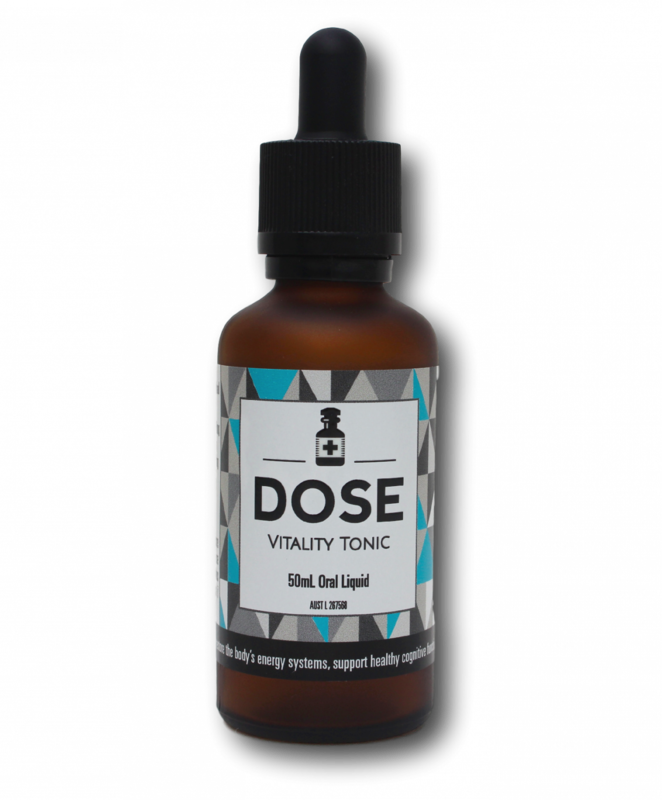 Dose Vitality Tonic was created in response to so many of my clients having poor energy, and being stuck in that “high-stress/bad sleep/ energy quick-fix” cycle. I wanted to create something that nurtured damaged energy pathways back to life, so that people stopped feeling powerless, and instead gave them the vitality boost they need to take charge of their health again. Q. Can you tell us a bit about how it works to deliver a natural dose of energy? A. Dose contains three Chinese herbs in high doses. Korean ginseng is one of the most phenomenal herbs going around – and one of the most prized! It has been shown in studies to do everything from improve cognition, boost energy, give the libido a kick, and even improve insulin sensitivity. I combined it with ginger, a circulatory stimulant, to give an immediate kick without caffeine. The last herb is Dang Shen, which is known as a tonic herb and is the bearer of the long-term benefits in the blend. Q. What is the optimum dose to take for the best results? A. Five millilitres, once a day is enough. I recommend it takes the place of your mid-afternoon ‘pick-me-up’. A second serve is safe if you’re left wanting more. Q. How does food affect a person’s skin? A. Food not only delivers the building blocks for our bodies to create healthy skin in the first place, but plant foods especially can be a rich source of complex phytonutrients that have therapeutic actions – from hydration, to stimulating growth and repair. A. Get the basics right first: water, protein, and omega-3 fats. That means a minimum for two litres of fresh water daily, plus an extra 500-700ml for every coffee consumed or every hour-long workout. Protein and omega-3 can be found together in oily fish, so enjoy salmon, fresh tuna, and sardines for a glowing complexion. When we get down to the smaller guys – the micronutrients – it’s all down to your individual needs. Nuts and seeds will deliver some zinc, while green leafy vegetables will provide vitamins A & C. I also recommend embracing teas for skin health: fresh marigold flowers are my favourite, as they help keep the lymphatic circulation moving along so that you’re less prone to breakouts. Q. What are the best foods to eat for healthy hair and nails? A. I know I say it a lot, but get your protein right! Beyond that, you want zinc, biotin, and silica. The list of foods for good skin looks a lot like the list of foods for good hair and nails, but I’m going to add eggs to the list for it’s healthy hit of biotin. Q. What is your skincare philosophy? A. Once the inside is working well, it’s time to get going on the outside. Cleansing the skin every day is essential, to wipe away the grime of daily city living. Moisturising is equally as important, to keep the skin hydrated and improve its barrier function. There are two real key points in how I choose what I put on my skin: I want something that isn’t going to increase toxic load, and I want something loaded with skin-healing phytonutrients. Q. What does your skincare routine look like? A. A gentle cleanser (or a twice-weekly exfoliant) is how I get started. If city grime or gym sweat have gotten the better of me and I feel a breakout coming on, cold green tea spritzed regularly over the face acts as an amazing antibacterial. After that, I’m all about hydration – I like a light aloe-based moisturizer in the morning. At nighttime, I get a little heavier with how I hydrate. Serums and oils are great carriers for plant actives, so I look for something with rose hip for a vitamin C hit (it boosts natural collagen synthesis and skin repair while I’m asleep). In an ideal world, both your bathroom cabinet and your fridge would be home to many of the same, plant-based ingredients. We should put on our skin the same things with which we nourish our bodies.